Summer crocheting is in full swing here in New England the past few weeks as we have been enjoying some unseasonably cool weather. You won't hear a word of complaint from me! I love cool, dry days and cozy nights! 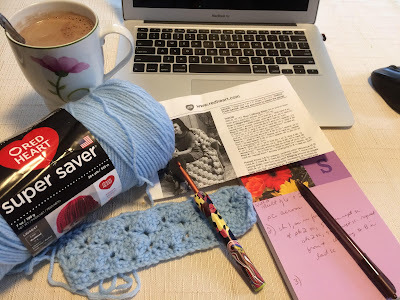 A friend recently commissioned me to crochet a twin bed sized afghan for each of her children but I had to tell her that a project like that would most likely have to wait until the hot summer was over and the cool fall weather arrived. And then I ran across a great sale on Red Heart Super Saver yarn, quite by accident since I would not normally drive a half hour to purchase yarn. I'm so spoiled having a Michael's and a Joann's and a Walmart with a good craft department within 5 minutes of my house. For some reason, I looked up AC Moore online to see if I could get a better selection of the colors I needed, and there was the sale announcement! Naturally I had to go! Not only did this store have a good sale, but they also had a better selection of exactly the colors I was looking for. I purchased a boatload of yarn that day! And then the cool weather pattern set in. Perfect timing! ...and incorporated a second color once I had the pattern rewritten. It was nice enough, but seemed a bit too busy considering that there would be seven colors involved. This pattern also required a bit too much thought, and I have discovered that thoughtless patterns are so much more relaxing! I must be getting lazy in my old age! So I moved on to this wave pattern, also from the Red Heart website. It was actually shown in gradients of several colors, so I knew it would work with my colors. 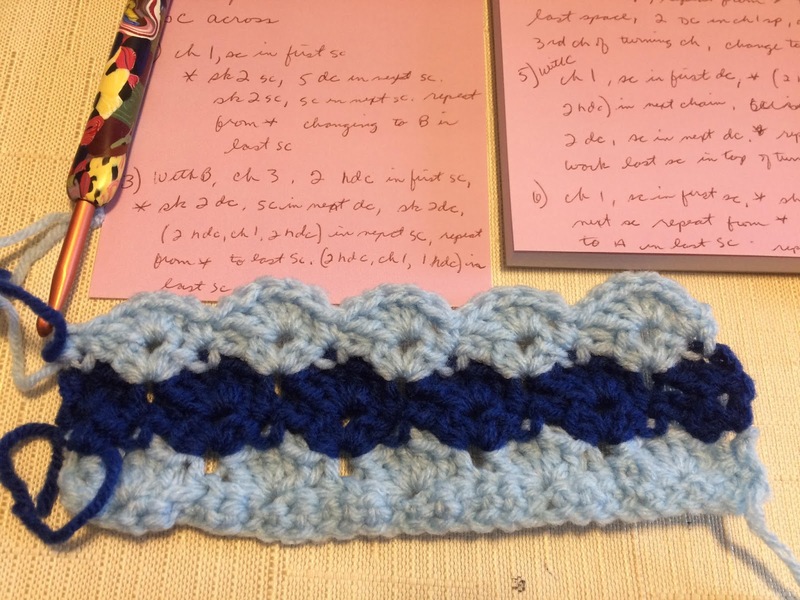 The only question was if I would enjoy working the pattern. So I gave it a try. It wasn't too bad, but there was something about it that didn't sit well with me. 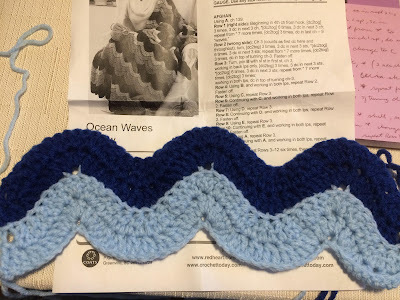 After working a few repeats, I realized what I was not liking was the extreme shape of the wave. It was too steep, not as gentle as I wanted. So out came those stitches and I kept searching. 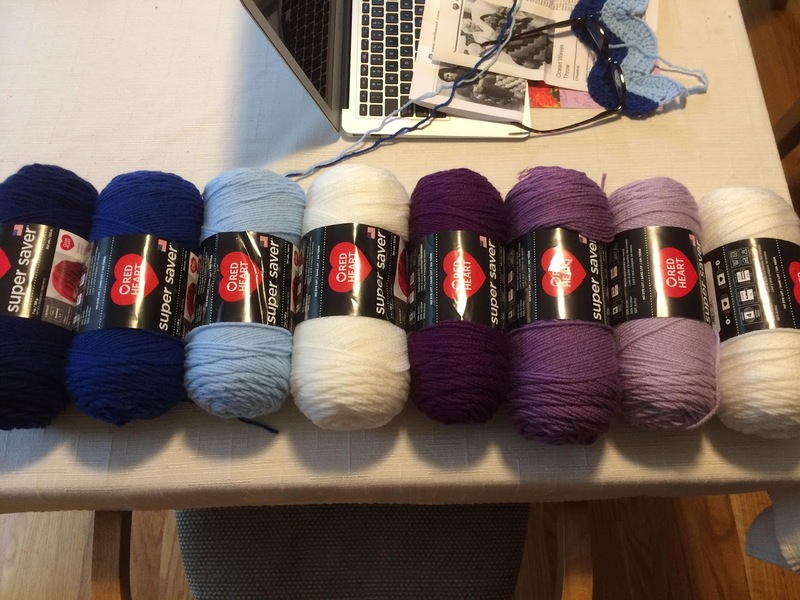 These are the colors for the girl's afghan I am making. In order, they are: Soft Navy, Royal, Light Blue, Soft White, Dark Orchid, Medium Purple, Pale Plum, Soft White. Next time I'll share with you the pattern I finally decided to stick with and some pictures of my progress. The cool weather only lasted a short time and we are heading back into some sticky hot summer weather now, but it was great while it lasted and allowed me to get a head start on this fun project. I'll enjoy summer while it's here, but fall can't come soon enough for me! How about you? So good to see a post from you! Love the colors in the girl afghan. Red heart soft white is a favorite of mine - not a stark white nor a yellowish white. I love the soft ripple pattern on Attic 24. Hope you are enjoying your summer. You would not like Texas - our summer has been extremely hot and humid - 90 plus temps with 90 plus humidity - not a good combination. Enjoy your remaining summer before your children are back to the school routine! So good to hear from you! Love the yarn for the girls afghan. Red Heart soft white is my favorite - not stark white and no yellow undertones. Have you seen the soft wave pattern on Attic 24. I really enjoy her pattern and have used it several times. You would not like our Texas weather - 90 degree temps and 90% humidity - miserable summer weather here. I hope you enjoy the remaining summer with your children - school time is just around the corner! Hi Rogue Pony, thanks so much for writing. I am sorry to say I used up all I had of the Riviera fabric line on that little quilt that I made with the jelly rolls so I cannot help you. You might try ebay if you haven't already. If I do happen to come across some, I will let you know.